Have you ever wondered what a clam shack looks like in the winter? Well, if you visit Iggy's Doughboys & Chowder House in Warwick, RI, you'll see that it is anything but washed up. 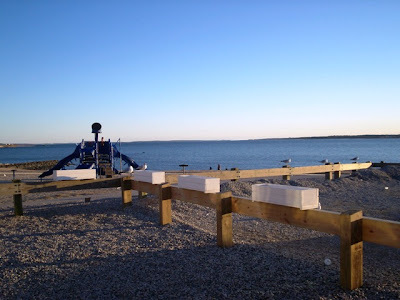 On a spur of the moment decision, Mom and I decided to take a drive to Oakland Beach for some delicious fried seafood and soft, sugary doughboys. We pulled into the gravely parking lot at around 4 p.m. This was the first time that Mom and I had been to Iggy's when we weren't surrounded by pushy beachgoers. Since it is February, the outside ordering window was closed and the parking lot actually had several available spaces. Located right on the water, I believe that Iggy's was once the site of a large amusement park. In the summer, the sand is crawling with bikini babes and shirtless greaseballs catching some rays. 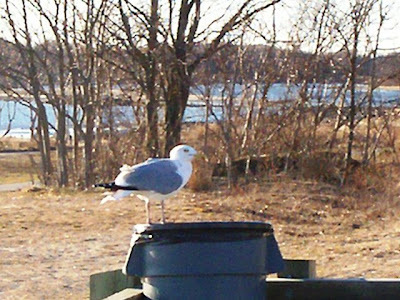 Today, however, only the seagulls remained as they tried their best to get anything they could out of the nearby garbage cans. We stopped for a minute to check out the outside menu, made our decision, and then quickly went inside to find a table and get warm. While Mom had a seat, I stood at the counter behind a few folks who were waiting to place their orders. In front of me was a pretentious couple who actually asked one of the girls behind the counter if there was a more "upscale" seafood restaurant nearby. How rude! 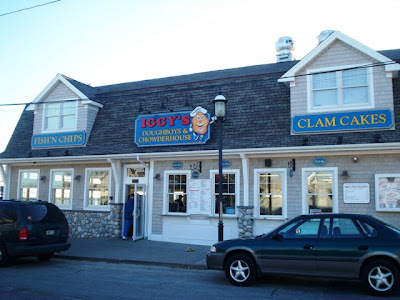 The girl gave them a few suggestions, and the couple reluctantly ordered a cup of chowder and bag of clam cakes anyway - despite Iggy's being a just clam shack. The snotty girl probably thought that this was going to be her Valentine's Day dinner, and she was not happy about it. To top off their misery, an old woman on the side of them reminded the pair that they should have cut a coupon out of the Yellow Pages so that they could get a discount on their meal. Hysterical! That couple probably never heard the word "coupon" in their lives. Get over yourselves. The cashier handed me a receipt with a number on it, and told me that she would call my number when my order was ready. I joined Mom at a small table that she had chosen at the corner of the dining room. This was the first time that Mom and I had eaten inside of Iggy's. We usually just stuff our faces in the car with the windows down so that we can smell the ocean air. At first, I had a weird feeling that the place was going to be a pig sty. I was very wrong. All of the tables and booths were neat and clean, the condiment section was organized, and there was no sign of trash left behind anywhere. 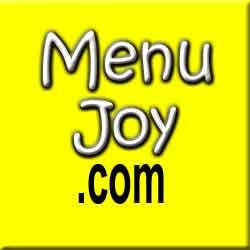 The staff was courteous and was very patient with some of the confused older customers. On the counter there were two large display cases featuring Iggy's merchandise. I'm still kicking myself for not buying that ornament of a smiling doughboy. Perhaps someone could send it to me as a post-Valentine's Day gift. It was adorable. Speaking of Valentine's Day, the miserable couple who seemed to be disgusted with the place had just received their order. They both looked terrified of their chowder and clam cakes, and instead of having a seat in the cozy dining room, opted to go back out into the cold with their "ordinary" meal. Get a life. That girl probably cried all the way home. The staff at Iggy's was really cranking out the orders, and we hadn't been waiting long before I heard someone call our number. They set up the food on the tray in such a perfect way that I told Mom not to touch anything before I had taken a picture. We kept the hot doughboys in the bag so that they wouldn't cool off while we were eating our sandwiches and clam strips. Both sandwiches were huge - way bigger than we imagined they'd be. Sitting on a fresh torpedo roll, each piece of fish was cooked perfectly and was flaky and white inside the crispy fried shell. Mom said that it was one of the bigger fish sandwiches that she had seen. I agreed, because most restaurants give you a tiny fillet surrounded by a larger hamburger bun. Not at Iggy's. There is definitely a great fish-to-bread ratio. Mine was loaded with fresh vegetables and creamy tartar sauce and was absolutely delicious. Both of our sandwiches were one of the best we'd ever had. The fried clam strips were also amazing. Each strip was very clean with a nice crispy outside and a melt-in-your-mouth inside. There was hardly any chewing. They were served nice and hot and were not at all greasy. Mom said that she thinks that Iggy's has one of the best deals around for fried clam strips. Where else can you get a pint - or over a pint - for only $7.95 ... in the winter? It really was a great deal all around, both in taste and in price. Even the sodas were awesome. Although they have regular fountain soda, they also carry bottled sodas from the Yacht Club Bottling Company in Centerdale, RI. Delicious. Although we were stuffed, we just had to have one doughboy each before leaving the restaurant. The doughboys are an American version of the Portuguese malasadas. 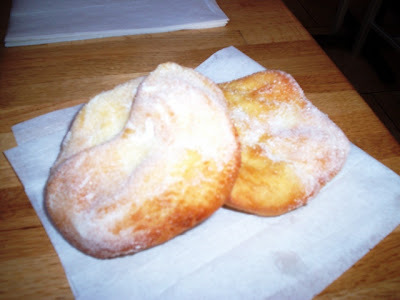 It is basically a fried donut with no hole and is covered with granulated sugar (usually while still warm). Iggy's version are smaller than their Portuguese cousins (kind of like a square donut), and were warm, soft, and very tasty. Again, the price is very reasonable, and it would be easy for anyone to put away a few of these with a morning cup of coffee. They even heated up well when Dad finished them off when we arrived home. He thought they were delicious. Before leaving, Mom and I decided to check out the restroom. Like the dining room, everything was clean and organized. When we got outside, it was almost like we were in the movie The Birds. We were literally surrounded by hungry seagulls just dying to know what was in the bag of doughboys that we were carrying. One even made an attempt to approach us! I pushed Mom aside and told her to "get in the car." It was all very dramatic. New England is all about clam shacks, but unfortunately most of them are closed during the winter months. 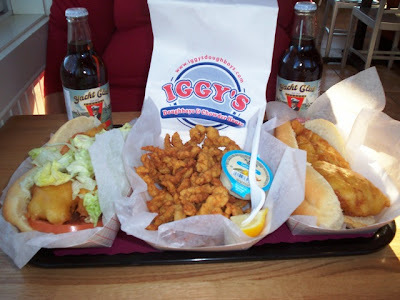 Iggy's obviously knows what the people want, and what we want is a fried seafood meal on a cold winter day. How could you go wrong with that? 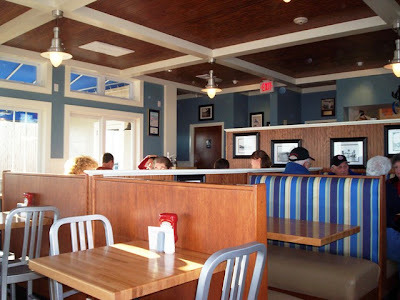 Iggy's Doughboys & Chowder House in Warwick is open year round. The winter hours are from 11 a.m. to 7 p.m. Sunday through Thursday, and 11 a.m. to 8 p.m. Friday and Saturday. The summer hours are from 11 a.m. to 10 p.m. Sunday through Thursday, and 11 a.m. to 11 p.m. Friday and Saturday. 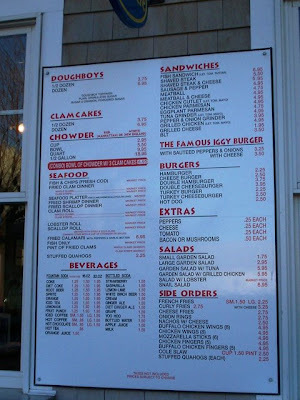 Iggy's Doughboys & Chowder House in Narragansett is only open seasonally.